If you ask if I have any New Year's resolution, my answer is 'nope'...but I do have a travel resolution for 2013 instead. 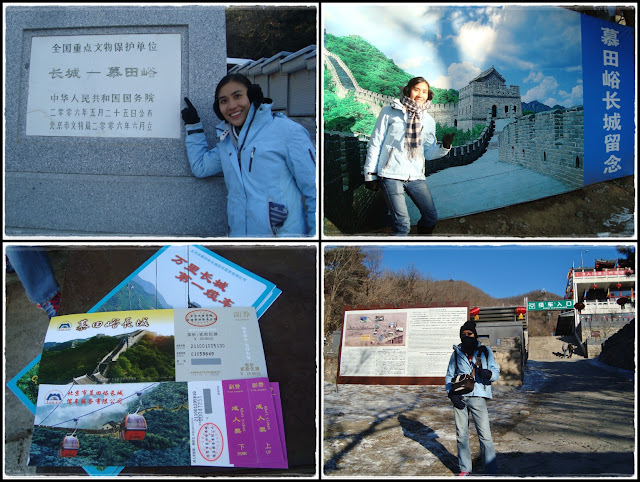 =P Thanks to the 2-year China visa that I made for China Rush, 2013 will be my cuti-cuti-China year...hahaha! =) Besides, Airasia definitely helped out with my travel plans by launching more China routes last year. My original plan was a solo trip until bro suddenly decided to tag along the day before departure. He frantically packed his stuffs within an hour and booked his flight tickets just one day before traveling...literally 'china rush'...lol!! 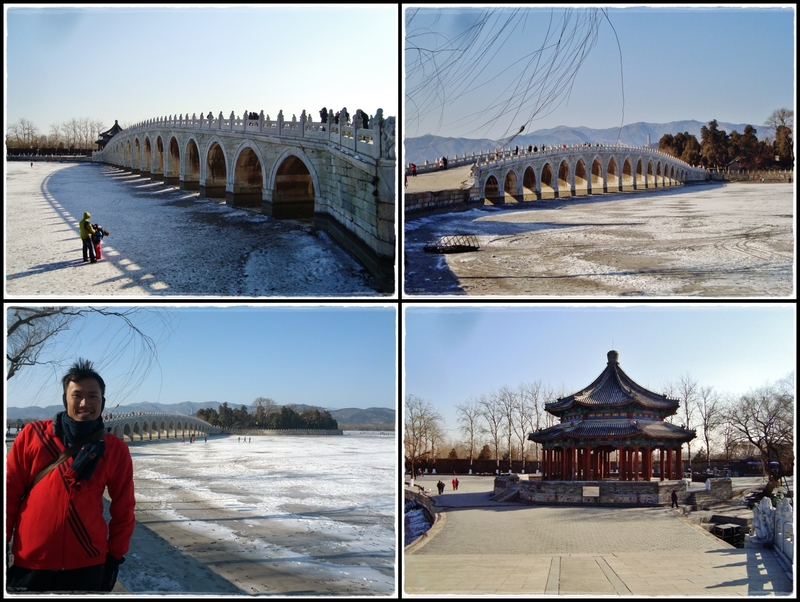 My goal for this trip was to cover all the main attractions in Beijing and I'm proud to say mission accomplished! P.S. Long post ahead as I'm gonna include some travel details here (just in case anyone's interested to read). 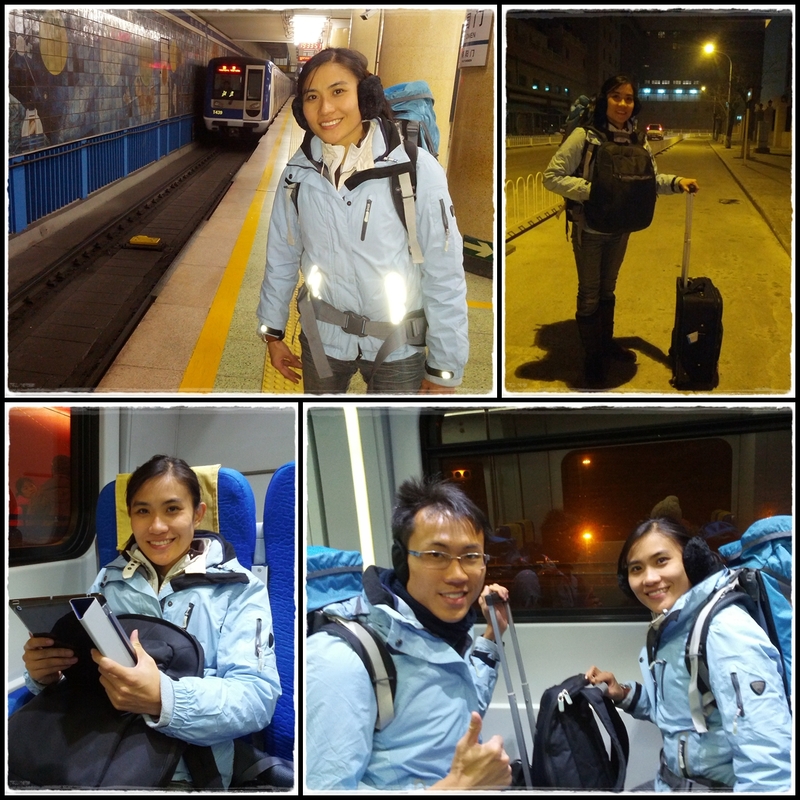 Traveling with our Amazing Race backpacks again and reminiscing the race days. 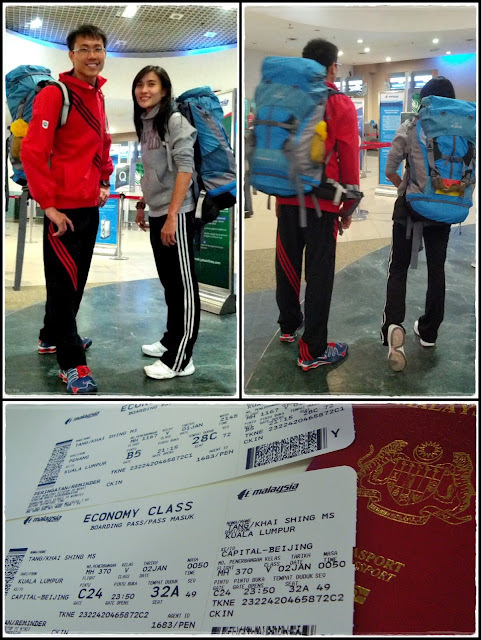 =) Dressed comfortably for our overnight flight from Penang to Beijing but we looked like we're endorsing Adidas...hahaha!! 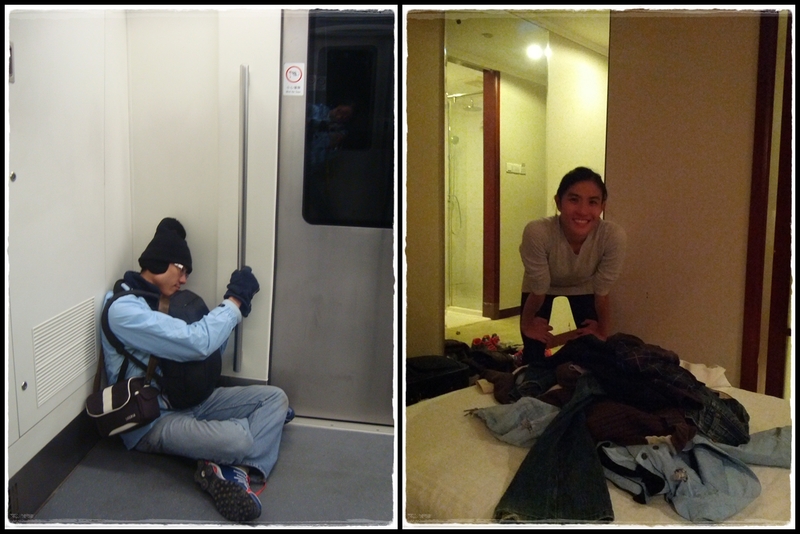 Getting ready to brave the cold before getting out of the subway station!! Bro looked pretty ridiculous...lol!! Our main mode of transportation was the subway...very convenient and it cost only RMB2 per trip no matter how far you travel...so cheap!! The Beijing Transportation Smart Card that we got made it so much easier to travel everywhere. Subways in Beijing are always packed but bro's sleeping skill is unbeatable...he can sleep anytime, anywhere...lol!! 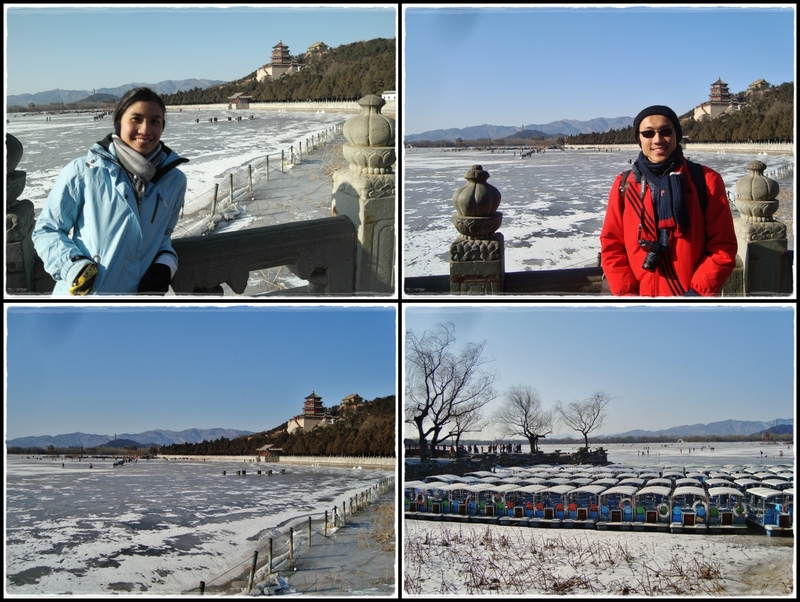 First stop: Summer Palace...used to be the summer resort for the emperor. 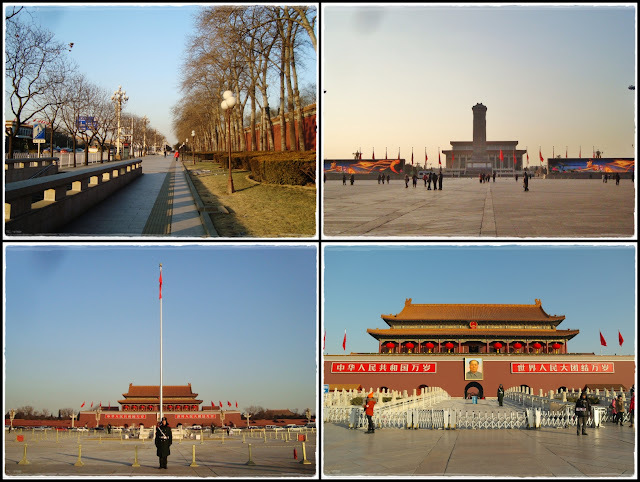 We got off the subway at Beigongmen station and entered through the North Palace Gate. 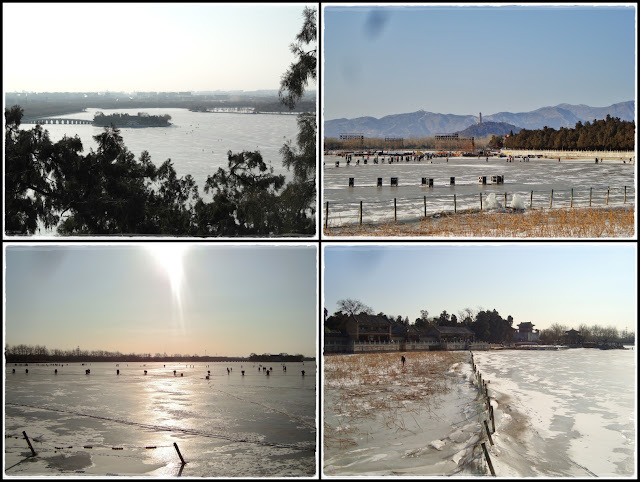 After paying the entrance fee of RMB20/pax (student price not applicable for foreign students), we were welcomed by this frozen Suzhou River and frozen boats. Welcome to winterland!!! Walked through Longevity Hill to Kunming Lake. 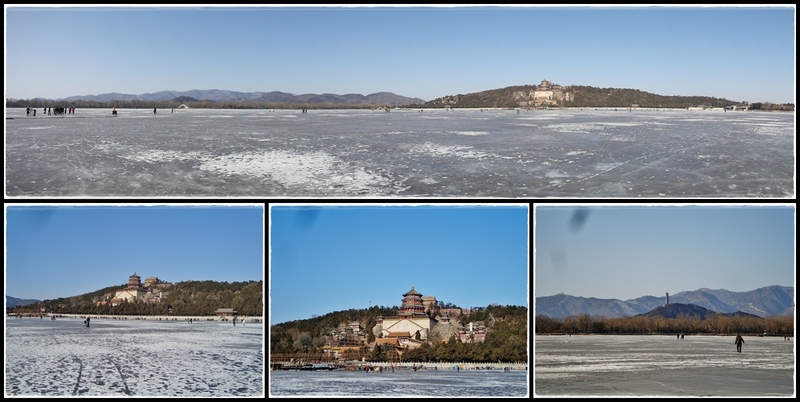 The entire lake was frozen and it looked like a skating rink...so cool!! Pardon me for my sam-pat-ness...we don't ever see this Malaysia lah. =P We found out that a massive stage was set-up on the frozen lake for the New Year's countdown...pretty cool huh!! Another interesting fact - the entire lake covering 2.2 square kilometres was entirely man made and the excavated soil was used to build the Longevity Hill (the hill you see at the top right corner of the pictures). The most interesting part of the Summer Palace for me is the frozen lake...lol!! Obviously nobody cares about the sign 'Don't Step On The Ice' coz everyone was walking on the ice...hahaha!! 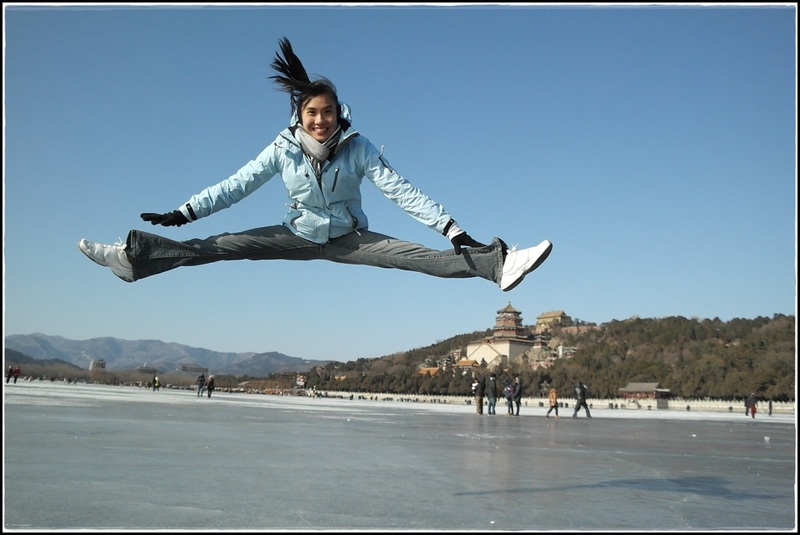 It was fun skate-walking on the ice but it was coldddd!! By the time we reached the Seventeen-Arch Bridge, the only thing we wanted to do was to get into the subway coz we were all freezing our butts off!! 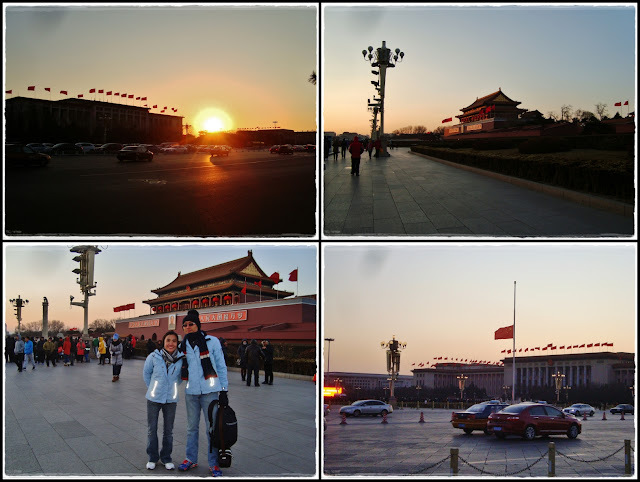 Sunset at Tiananmen Square. We got there just in time for the flag-lowering ceremony. Felt so good to finally get back to our hotel, Days Inn Forbidden City, after being out in the cold all day. 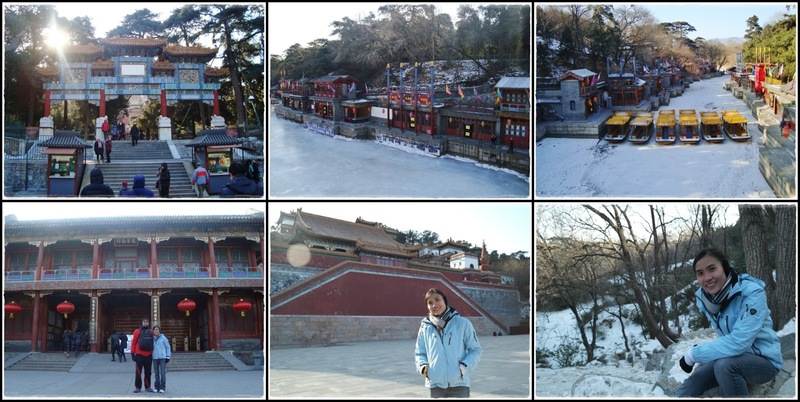 The freezing weather made me doubt my ability to cover all the places that I've included in my itinerary coz it was really tiring to walk around when the temperature is -10°C!! One thing good about our hotel is that it was within walking distance to Tiananmen and Wangfujing. Even though we saw the flag-lowering the day before, we still wanted to see the flag-raising ceremony the next morning at 7.36am...but but but...-14°C?!?!!! After getting off the bus, we then hired a mini-bus to Mutianyu. We paid the driver RMB75/way for the 30-minute journey. We could have negotiated even lower but the driver was quite nice so we didn't mind paying him a lil' more. Mutianyu Great Wall!! We were there quite early so there weren't many people there yet. 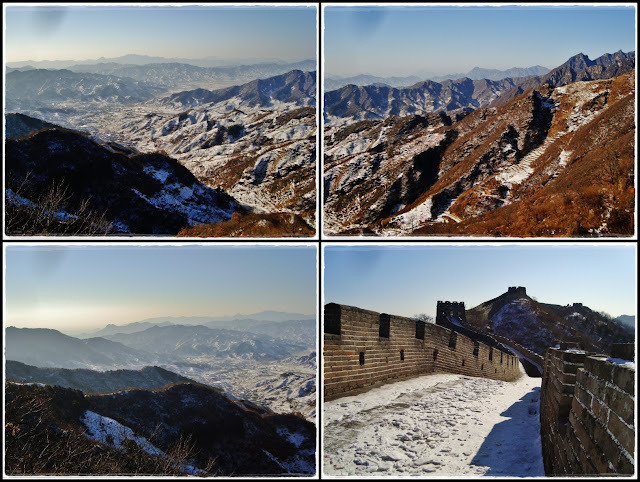 One of the reasons why I chose to go to the Mutianyu section of the Great Wall instead of Badaling was to avoid the tour groups. 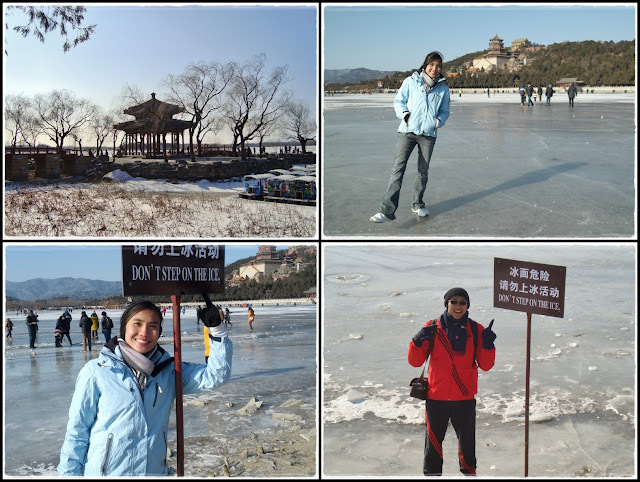 =P Besides, there are fewer tourists during winter season especially January coz it's the coldest month. We got our admission ticket for RMB25 (student price) and RMB80 for a round trip cable car. There were hardly any other people around so we didn't have to wait at all to get on the cable car. =) I was hoping to see more snowy scenery but it wasn't snowing for the past few days so the scenery was only a lil' white...but it would have been hard to hike if it was snowing. 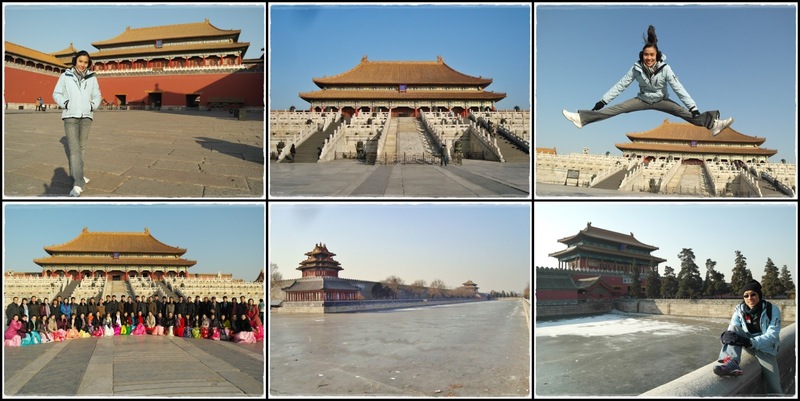 We were pretty lucky that it was a sunny day with blue skies and we were there before the smog crisis hit Beijing last week. 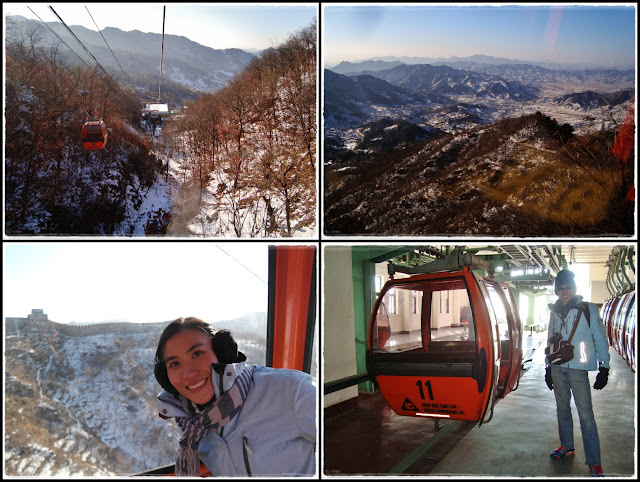 In awe of the scenery as the cable car brought us to higher grounds. Getting ready to scale the Great Wall!! 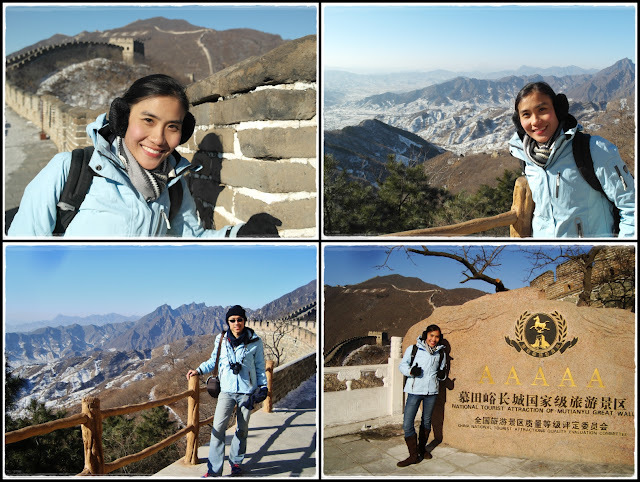 Breath-takingly beautiful scenery of the wall and the mountains. Took some 'lubang' pics from one of the many watch towers. We were really lucky coz it was such a clear day and the sun kinda warmed us up a lil'. 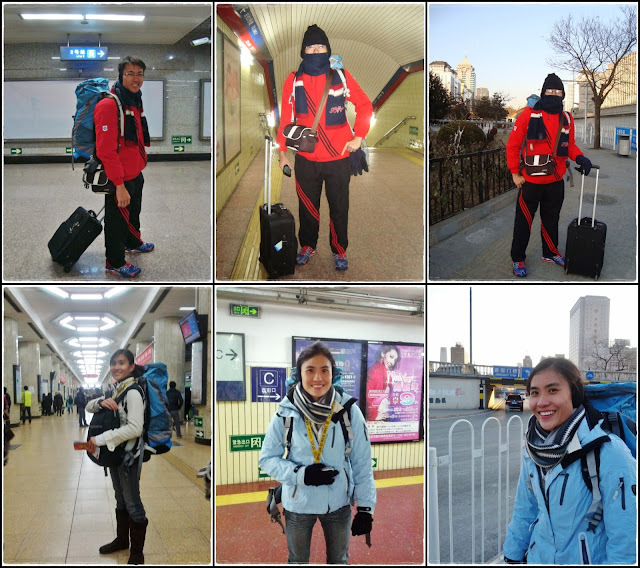 I was so worried that it would be too cold so I had 8 layers of clothes on me (nope I didn't get fatter)...lol!! We stopped to take pictures almost every 5 steps...hahaha!! We kept walking and walking until we came to this "No Climbing" sign. They didn't clear the pathways from that point onward so it was slippery and dangerous to walk on the ice. The Wall looks pretty much the same everywhere so I decided not to hike further but bro insisted that he wanted to go further and higher. So I took over his backpack, gave him 30 minutes, and he started sliding along the icy pathways while I waited at the watch tower and continue taking more pics. Spotting the light blue jacket as he ran up the slopes. These was taken by bro as he scaled up the steeper steps. 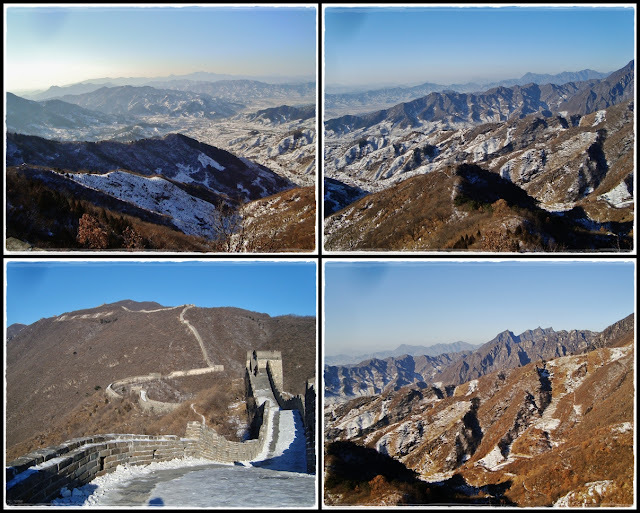 Magnificent view of the Great Wall from high up!! 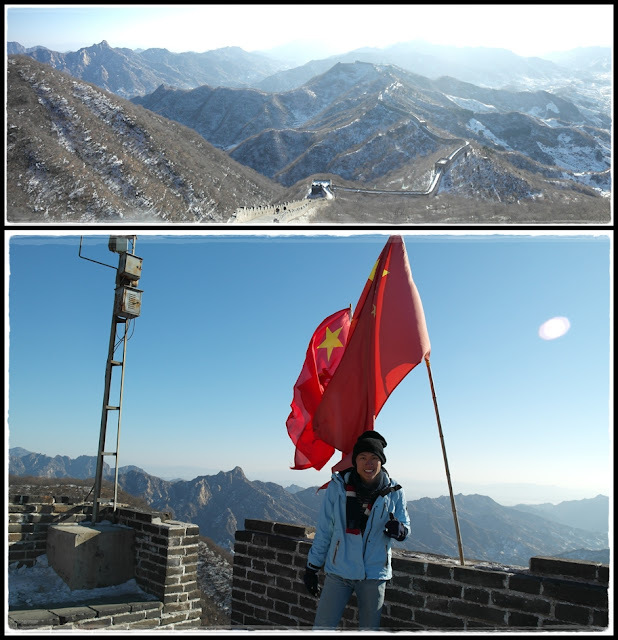 Woohoo...jumping across the Great Wall!!!!! Bro's versions of jump shots. 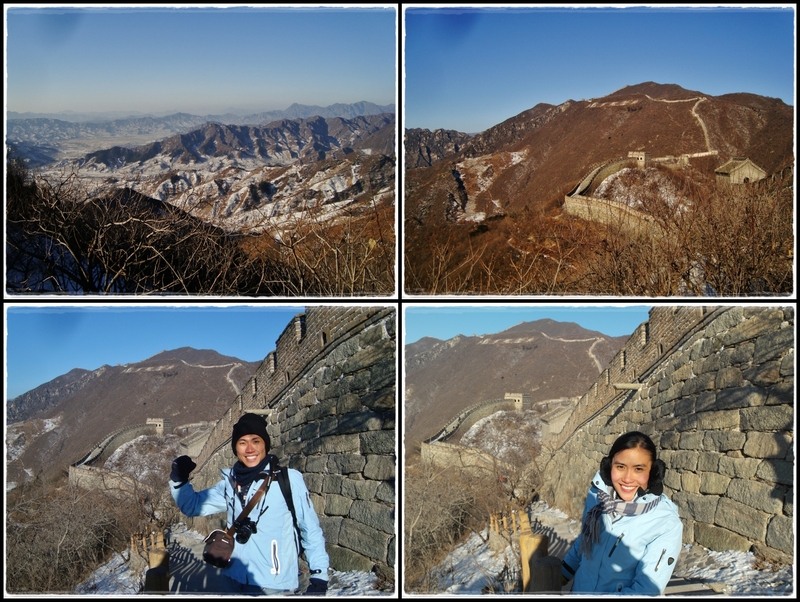 We were like 2 siao-kias jumping like crazy at the Great Wall...lol!! Enough of jump shots. Last few pics before making our way down by cable car at 12pm. 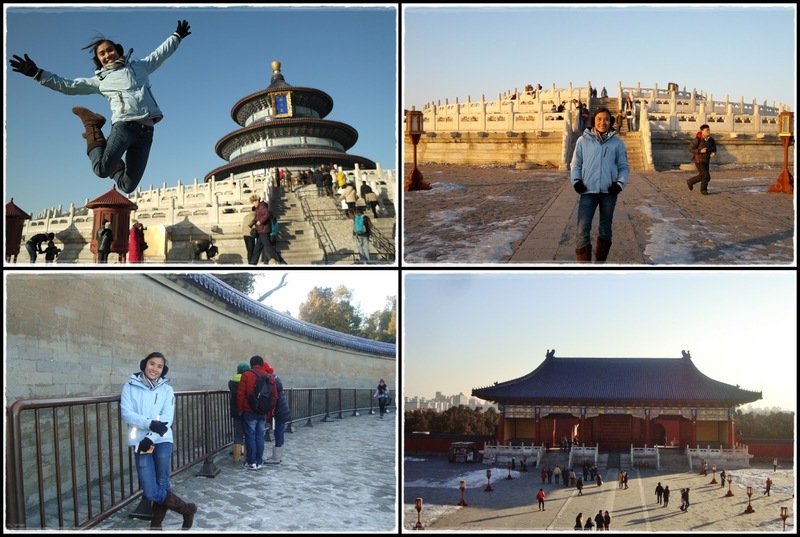 It was only about 2pm by the time we got back into the city so we decided to visit the Temple of Heaven. 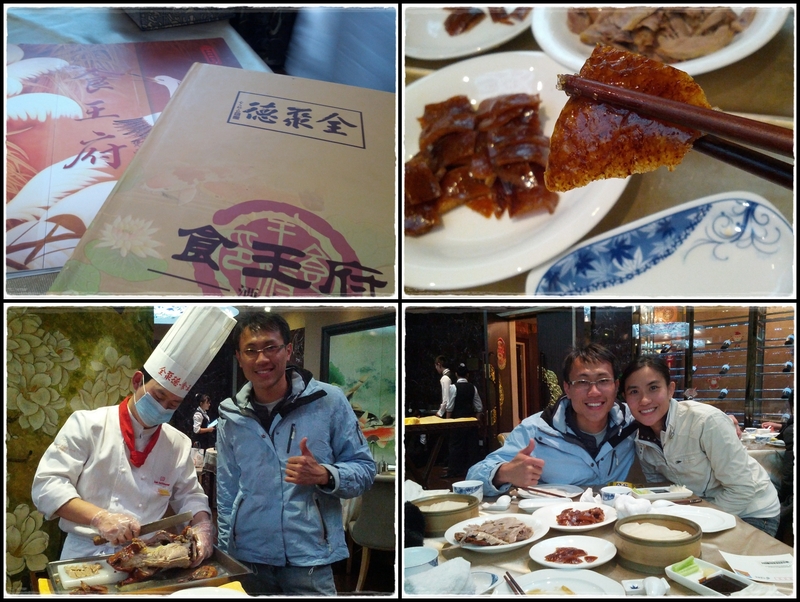 What a small world and coincidence to meet up with China Rush 3 cameraman, Lou & editor,Dingding at Tiantan! We were buying tickets and they spotted our blue jackets from the back...lol!! If we were to be 10 seconds earlier or later, we would have missed each other...life is mysterious and has its own ways. =) It was good to see 'em again after the race ended and toured Tiantan together. We bought the combination ticket for RMB30 and visited the Hall of Prayer for Good Harvests, The Circular Mound Altar, and Echo Wall. Last stop for the day - Bird's Nest & The Cube at Olympic Park. This was just a quick pit stop coz the cold was unbearable! Once again, we were here for the 3rd consecutive day...lol!! Finally a pic of me in Tiananmen Square and right in front of Mao Zedong's portrait. =P Typical tourist...lol!! Panorama from our Beijing trip. That's all for our sightseeing in Beijing. I had to drop by Dell Beijing office in the afternoon to run some errands. We then went to the Silk Market and I got myself a cover for my new Ipad and a tea tumbler. 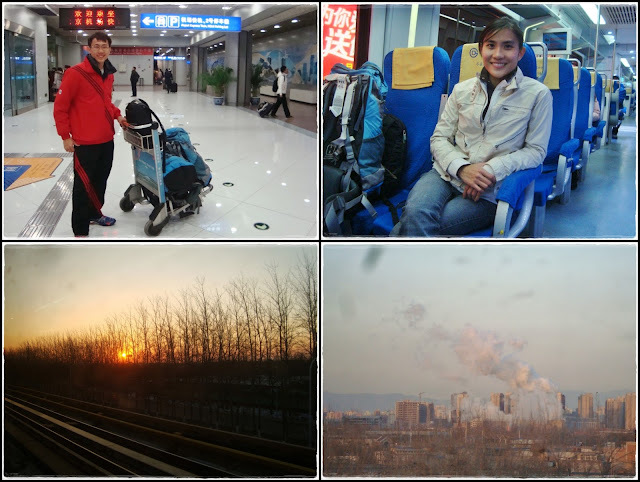 Took the 6.40am Spring Airlines flight from Beijing to Shanghai while bro flew back to KL. The ticket was pretty cheap and costed RMB400, even cheaper than taking the train. =) Thanks to YenShin for introducing me this airline and LeiSheng for helping me to purchase the airticket (the website does't accept foreign credit cards). Met up with China Rush friends (Jenn, Henry, Brandon, Lou, and Dingding) for dinner at Sichuan Citizen. =) Jenn then invited me to her European friend's house for Three King's Day party. 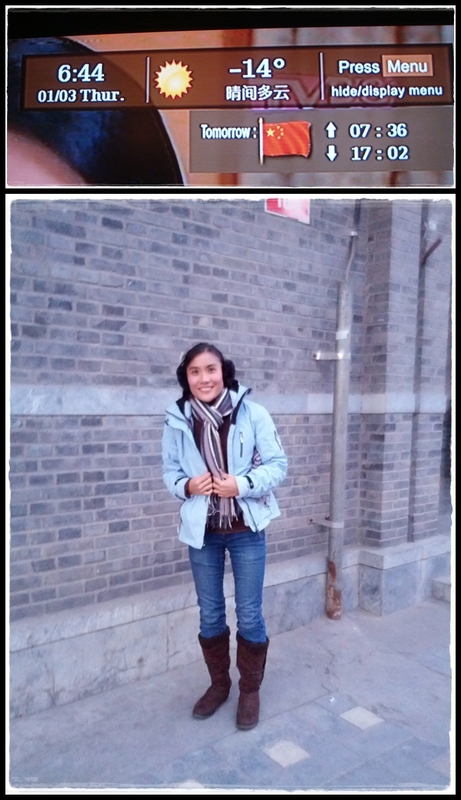 Went to Songjiang for work (stockcount) during the day. 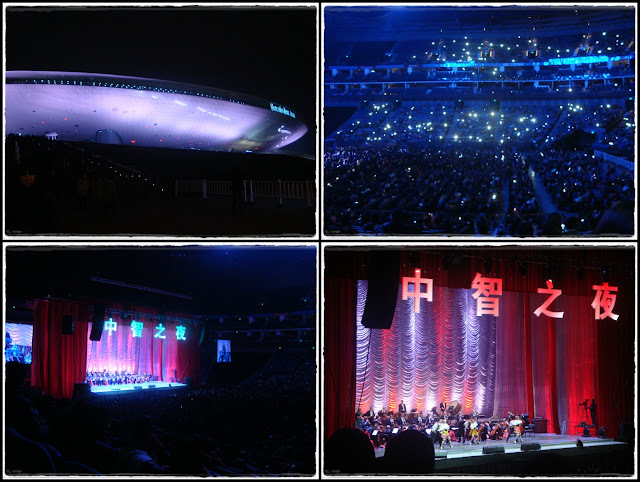 Henry had an extra ticket for an orchestra performance at the Mercedes Benz Arena so I got to tag along with Jenn and Winnie to watch the performance. Nice post. Wish to visit Beijing soon.